First, as noted above, the building is recognized as a contributing structure in the New Chinatown/Japantown Historic District. This designation is the only reason for the demolition review. In other words, if this modest building cannot be protected from the wrecking ball, then what can? Second, there are only two buildings left on this entire block which represents the northeastern corner of the historic district. Removing the one structure would likely doom the old Blanchet House building as well and thereby weaken the overall integrity of the historic district. Third, the fact that there is already a bunch of empty space on most of the block should not be ignored. Apparently, the PDC City has a long-term lease with NW Natural to use that empty space as a parking lot. Wouldn’t it be a better idea to put that parking area to highest and best use by renegotiating the lease and using that space for a new Blanchet House? The Portland Landmarks Commission will be reviewing the demolition request on Monday, January 11th. This represents a real test of the demolition review policy established by the City back in 2004. We encourage anyone concerned to let the PDC and the City Council know about it. More information about the proposal can be found here. That parking lot issue perplexed me during the last round of presentation of this project to the PHLC. Could you explain how a parking lot has more protections against development than historic structures. 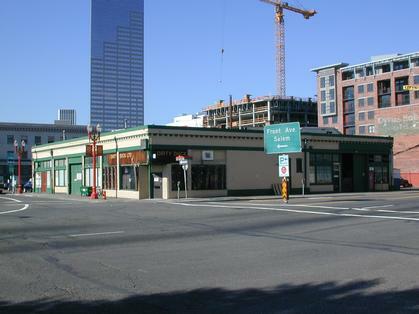 Is there anyway to provide the type of protects offered to that parking lot to historic structures in the future? The New China Town Link in the main post 12/23 is the only link to a district on the city’s website that gives no property information. I find the lack of public information vexing. Also, yesterday at the PHLC meeting it was stated that one site was determined unusable by the Blanchet House site selection process over the last 12 years, because of the track of land’s proximity to the blue and red MAX line tracks. Has anyone on that site selection task force noticed that the Dirty Duck is now along the green line? 95% of landmarks represent upper class white history-for the sake of equity certainly this already delicate historic district needs support on Feb 3rd at City Council. A point of clarification. Apparently it is the City of Portland that owns the Dirty Duck property, not the PDC. Either way, this is a bad precedent to demolish one of the only remaining buildings on the block – buildings that are contributing components of a historic district – and to then say we’re trying to become the most sustainable city in the world. The City has been more than glad to take away parking elsewhere, why is the NW Natural parking on the vacant part of the block deemed sacred?